Are you looking for travel and tourism career opportunities and wondering what travel jobs exist in Wholesale travel? Look no further! Wholesalers specialise in destinations like Africa, the South Pacific or Greece or products like Cruising or Golf tours or travellers under 35 etc. The great thing about wholesale is that you become a specialist in your area, you don’t need to know everything about every country or product on the planet. Think about your interests and your destination knowledge/ travel experience to give you a starting point for an organisation that may benefit from your experience or passion. A great entry level position, supporting reservations and the operations department. The role is varied and will give you the opportunity to see how a business runs as a whole. Tasks may include constructing itinerary letters, checking documentation, contacting operators for pick-up times or room confirmations. Another great starting point for a career in Wholesale. Reservations is a front-line position, dealing directly with the travel agent (or direct customer) selling the product over the phone, internet or by appointment (in the case of a direct customer). A soft sell role where the customer comes to you. Your product knowledge and customer service will be the key to sales in a reservations role. Reservations is a great way to increase your knowledge and a good grounding for career promotion within the Wholesale sector. Most wholesalers have a department specifically dedicated to airfare construction. A great role for those with excellent attention to detail. An Airfares specialist will book the airfare component of the product you sell and negotiate package deals with airlines. Some passengers will add pre or post travel onto their tours creating detailed flight itineraries for this department. A sought-after position with great perks if you like to travel! This department is responsible for sourcing and putting together the product that will be offered for sale. The starting point would be a loading position, loading rates and product into the system. Your next move into a product coordinator, would see you assisting the product manager. Your duties may involve; assistance with brochure production, itinerary/ tour construction and handling enquiries from the reservations team among other ad-hock tasks. Your next step would be a Product Manager, where you source product, negotiate rates, research new destinations, create brochures and more. Travel is usually required in this role to investigate the product before it is offered for sale. In the sales department you are responsible for getting your product/ brand out to the market. Calling on retail travel agents or selected markets (depending on your product). A Sales Coordinator usually works within the office answering queries and arranging presentations, famils/educationals and trade shows for the Sales Executive. A Sales Executive/ Manager is responsible for a territory or area. They traditionally work out of the office visiting existing and new clients and presenting the product. They work to targets to increase sales in their region. Sales Executives attend trade shows and take travel consultants on famils/educationals to trial the product. A Director of Sales is the next step, a more strategic, big picture role, managing a team of sales executives. The creative department within a wholesaler. Working closely with the sales team this department is responsible for creating brand & product awareness & distribution. As a Marketing Coordinator you would assist the Marketing Manager creating branding and product campaigns, social media content, web content & maintenance, big picture strategy, competitor analysis and marketing distribution channels. If numbers are more your thing, the finance department could be the way to go. Handling accounts payable, receivable, reconciliation and assuring the business as a whole runs to budget. 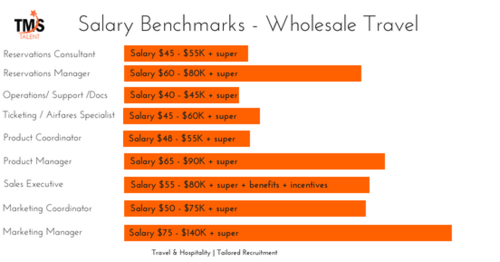 Below is an indication of salaries in the Wholesale Travel Industry to give you a guide of what you can expect in the various positions. If Wholesale travel sounds like a career option for you then check- out our latest wholesale positions today!